Alright, we are in the dog days of summer, and things are heating up outside and on the grill. So let’s talk steak. 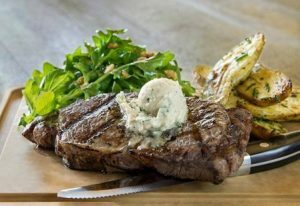 First things first, start with a good piece of meat: New York, filet, or rib-eye would be perfect! Something nice and thick. About 30 minutes before you grill, take the steak out of the refrigerator and let it sit at room temp. 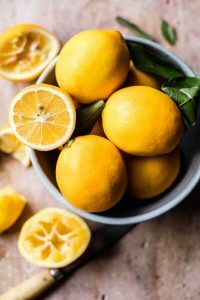 This will help you get a good, even cook once it hits the heat. Be sure to pre-heat your grill to high. Lightly rub your steaks with a little olive oil, and sprinkle with my Dish D’Lish French Seasoning Salt (this is so delicious on steak! ), or sea salt, fresh cracked pepper, and some smoked paprika. 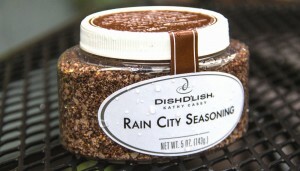 Or if you want to try something really different, our new Dish D’Lish Rain City Seasoning has Caffé Umbria Coffee in it and Theo’s Coco Nibs. It’s super savory, dark and delicious on steaks! Place the steaks on the grill and cook until nicely marked on the first side. Leave it be now – don’t move them around! Then turn over and cook on the other side. 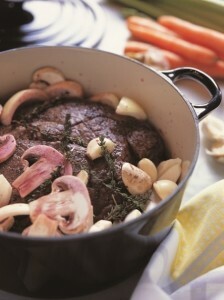 Depending upon your steaks thickness will depend upon how long to cook it. Remember the meat will continue to cook a bit after removing from the grill. And you can always put it back on for more heat; you just can’t go back the other way! Serve topped with a simple to make herb garlic and blue cheese butter, your family’s favorite local veggies, and an ice cold local brew. with Red Wine Salt and Blue Cheese Butter on California Pizza Kitchen’s new menu! This is a big bold flavored butter so a little dab will do ya! 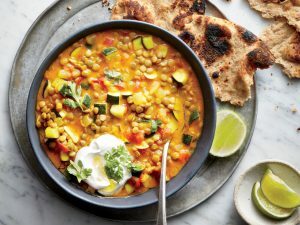 You can freeze any leftover or use on grilled veggies too! Whip the butter, cheese, garlic, hot sauce, mustard, salt, and pepper together until smooth. Then add the green onions and herbs. Mix until well incorporated. Refrigerate until needed. Bring to room temperature before smearing on grilled steaks, or veggies. #TurkeyHack! 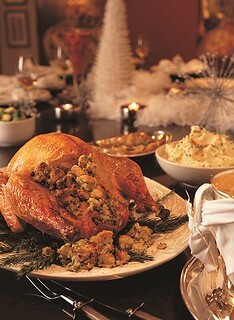 Okay, you roasted the beautiful bird, enjoyed all the trimmings, and stuffed yourself silly. Now what do you do with the leftover turkey? Don’t just leave it on the counter while you start playing games or watching a game on TV. Get ready to do a #TurkeyHack Turkey Stock! First things first: remove all the meat from the turkey. Slice up the breast and use for sandwiches – you know that you’ll want one later! 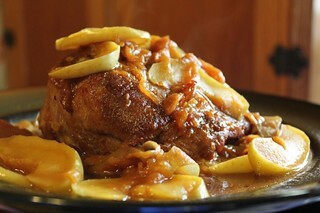 Save the dark meat for soup and other yummy dishes, which we will get to in a minute. And make sure to remove any string, from the bird or leg ties – you don’t need those anymore! Next, whack and/or break up the turkey carcass; yes, use your hands! Put it all in a big pot, and cover with water (if you have them, add in big chunks of onion, celery tops and carrots). Now put the whole thing on the stove and bring to a boil, then reduce the heat to low and simmer for about 2 hours (make sure to set a timer!) while you enjoy some post-dinner fun. Now, strain out the solids reserving the delicious turkey stock. Put stock back in the pot and reduce by half on a low simmer. 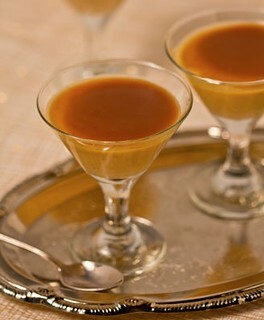 (You need about 5 cups for the gravy recipe – and if your short stretch it out with a little chicken broth). Melt the butter in a large, heavy saucepan. Add the onions (and mushrooms if using) and sauté over medium-high heat for about 2 minutes. Add the flour and stir vigorously until combined and smooth. Cook for about 1 minute. Add the stock all at once and whisk vigorously so as to eliminate any lumps. Reduce the heat and simmer for about 10 minutes, until the gravy is nicely thickened. Season with salt and white pepper.